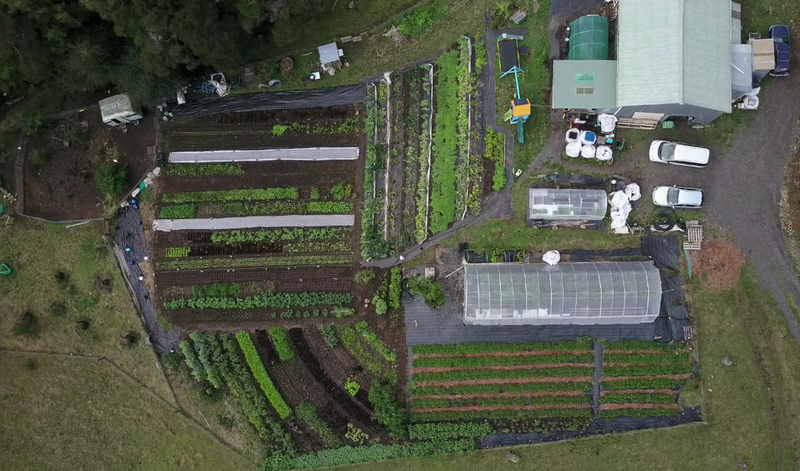 We are growing over 8,000 kg of food a season on 1/4 acre of land since 2014. We believe the future of food is in small scale-diverse and local production. We are very passionate about growing real food for our community. We specialize in growing fresh seasonal vegetables, herbs, strawberries, salads and microgreens. We are selling our produce at the Thames Saturday Market and Clevedon Farmers Market on Sundays October to April. Our gardens are certified organic by Organic Farms New Zealand #1009. We are located within Pakaraka Farm, which has been organic since 1991. We are a heap stricter than what the organic code allows, and we don’t use any commercial herbicides, pesticides or fungicides at all. The gardens are spring fed from a water source, located 250 meters above the gardens, coming from the bush with no uphill residence. By implementing a sustainable soil fertility program and using no-till cultivation methods, we are increasing the life in the soil, building organic matter in the soil and mineralizing the soil with natural macro and micro nutrients. Along with implementing Permaculture design and regenerative soil practices, we are aspiring to grow nutrient dense food. Our market gardens is off the grid, and is powered by a 5kwh solar system. The system runs our cool room and charges the electric delivery car so our vegetables will be delivered in the same way that they are grown – with care for the earth, sunshine and love.